The class will include handouts and refreshments. The cost is £30 per person (min. charge £180). I run small group sessions for up to 12 people and bookings will be made on a first come first served basis. I can also run bespoke private 1:1 and small group sessions in your own home. Please contact me to discuss and arrange this. If you are interested in doing a paediatric first aid course with a group of your friends eg antenatal group – I can come to your house at a convenient time. I am up to date on European paediatric life support, renewed every four years. Note : this course is a lifesaver course, over two and a half hours, covering the essentials you need and the real practical advice that will help you at home. If you are looking for a longer course please ask me for recommendations of other first aid providers. 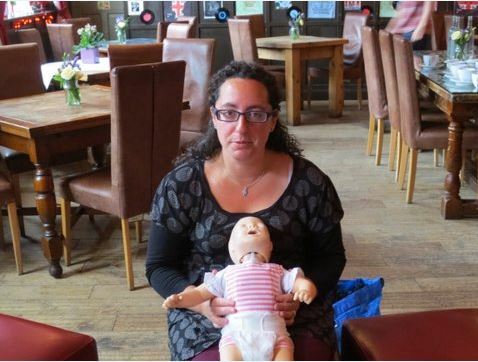 “Many thanks to Ella Rachamim from Be Ready To Parent for her very useful and informative talk yesterday on ‘How to keep your baby out of A & E’ – we talked about fevers, choking, recognizing signs of meningitis. Very good information to have on hand with a young baby.” Elise, Director of Nurturing Mums.